The 21st century world demands that Education be genuinely transformational. Basic education must offer concrete pathways for holistic growth: personal, social, cultural and spiritual in a global perspective. The world expects institutions to cope with the consequences of the phenomena of globalization, technological advancement, fast-paced sharing of information, and climate change. Thus, schools must be on guard and aligned with the transforming society. To remain relevant, ICA stands vigilant in updating itself. Research and innovation are integral to the ICA academic culture; the curriculum evolves with Information and Communications Technology and changes in the students’ disposition, demands and expectations. The curriculum provides opportunities for the development of the four C’s of 21st century learning: critical thinking, creativity, communication, and collaboration. There is also focus on the development of student’s decision-making skills and the judicious use of technology. While the academic curriculum continuously evolves, ICA remains firmly grounded on its roots as a Catholic school for students with Chinese ancestry. Thus, programs and activities are laden with Catholic and Chinese-Filipino values and are carried out in an atmosphere that builds faith, hope, and love. The pedagogical innovations of the school, with its inherent Catholic values and characteristics, intend to facilitate learning that is directed towards life-long benefits. 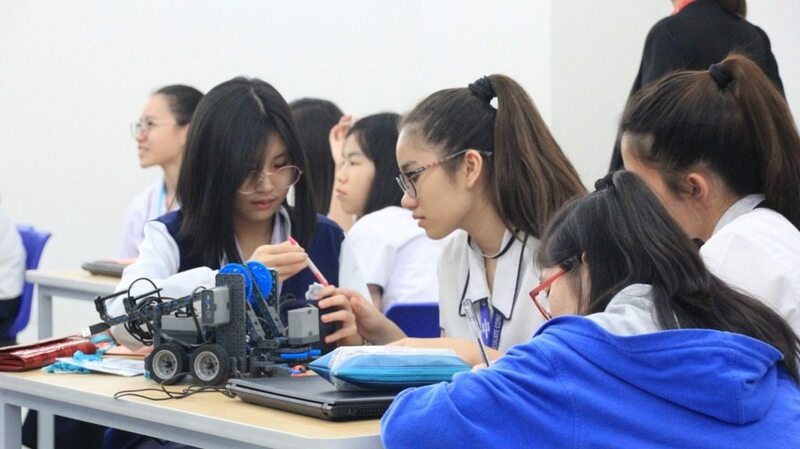 As a college preparatory school, ICA looks beyond and channels students’ energy and potentials to make them responsible, independent learners and productive and committed members of the world community. The Christian Life Education (CLE) is designed to lead students through the process of learning and living their faith life within the confines of interdisciplinary, deliberate, systematic, and sustained activities. The CLE program centers on the three dimensions of the Christian faith– doctrine, moral, and worship– expressed in our Catholic beliefs, values, and traditions. The basic principles of the program focus on man as an image of God and the object of His self-communication and loving action. CLE aims to form students to become mature Christians, grounded on a spirit of prayer and joyful thanksgiving. With the world having shrunk into a global village due to information technology, it has become necessary for Communication Arts in English (CAE) to provide the students with skills-building activities to make them proficient in the English language.Aside from acquainting the students with the great minds of the past and present, the literary selections also help them reflect on their experiences so that they may make wise decisions in life. Significant Human Experience (SHE) approach in the study of literature is used to recognize the individual differences of the students, thus leading them to become more analytical and creative. The CAE program uses the Process Approach to Writing in developing the students’ writing skills and research skills. Moreover, activities to improve the students’ oral communication skills are given in all year levels; these include delivery of extemporaneous and impromptu speeches and poem interpretation. Media Education, offered across year levels, educates the students to become autonomous and judicious consumers of mass media. Ang araling Filipino bilang asignatura sa Mataas na Paaralan ay nagbibigay-diin sa komunikatibong paraan sa paggamit ng wika para sa pagiging mapanuri, malaya at sa ganap na pagkatuto ng mag-aaral sa iba’t ibang larangan tulad ng kasaysayan, sining, media, pulitika, kultura at iba pa. Ang panunuri, pakikipagtalastasan at mga kasanayan sa pakikinig, pagbabasa, pagsusulat, pagsasalita at panonood ay naaayon sa sunod-sunod na antas ng paglinang. Inaasahan na ang kanilang pag-aaral sa Sining ng Komunikasyon sa Filipino ay magbubunga ng kanilang pagiging makabayan at pagmamalasakit at pagtangkilik sa Pilipinong kultura. Ang mga wastong pag-uugali at pagpapahalaga ay nabubuo sa pamamagitan ng mga aralin sa Wika at Panitikan mula sa iba’t ibang rehiyon at sa anyong Klasiko hanggang sa Modernismo. Mathematics is a discipline that effects and promotes order and harmony; it is a study of relations, systems and processes, and aims to guarantee a wide spectrum of career options based on students’ interests. A balanced interplay of major strands — Numbers & Algebra, Measurement & Geometry, Statistics & Probability, Problem Solving and Calculus—is achieved through the spiral approach which helps ensure that students are prepared for further study and application of the subject in various fields. Over the course of their study, the students will be adept in the use of mathematical language and will become proficient in dealing with concepts and processes. They will develop their ability to make connections between different topics through the use of technology. The lessons will not only engage the students to develop their critical thinking skills, but will also allow them to communicate the various ways Mathematics can be applied in their lives. The Science courses, namely Integrated Science, Biology, Organic and Inorganic Chemistry, and Physics, offer opportunities for the students to gain knowledge on the nature and processes of science concepts, its application and importance. Laboratory experiments help in the students’ development of higher order cognitive skills, values and attitudes to further understand natural phenomena and environment patterns and issues. Investigative research is an essential part of each Science course which leads students to use their creativity and hone their skills in the processes of science. Scientific investigations allow the students to experience the challenges and benefits of research and experimentation as tools for development of science literacy. Science lessons and activities emphasize man’s role as stewards of God’s creation. Students are led to examine their contribution in the preservation and conservation of the environment. They are challenged and empowered to adopt a lifestyle that promotes ecological sustainability. Araling Panlipunan focuses on developing skills and values inherent in the disciplines of history and economics. Through the study of the past and the present, students will understand chronology and connections between causes and effects and between continuity and change. History enables students to see how people have dealt with fundamental questions on truth, justice, and personal responsibility, how ideas have real consequences, and how events are shaped both by ideas and actions of individuals. Integrated in the course on history is a study on the experiences of the Chinese Filipinos, from the first generation of migrants to the Philippines to the present. It is focused on the assimilation of the Chinese into Philippine culture and society. 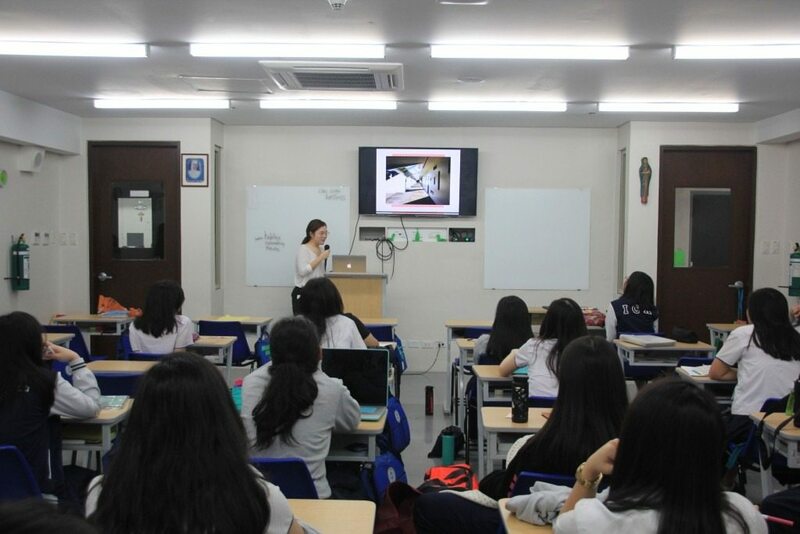 Students have the opportunity to do history as they work on a project that allows them to explore their own family’s history as Chinese Filipinos. Economics provides a unique opportunity for students to combine knowledge of the theoretical with practical and real-life decisions about employment options, consumer choices, personal finance, and entrepreneurship. Through an understanding of basic economic concepts, students become active citizens who can participate in building a robust economy that provides for the needs of all members of society. Built into the Economics course is an exercise in Social Entrepreneurship, an endeavor that merges the students’ interest in business with their call as Christians to help the marginalized members of society. Through a series of activities that culminate in a bazaar, students experience the challenges of establishing and managing a business that provides solutions to social problems. Quarterly debates are held in classes to engage the students in social, political, or economic discourses and develop their critical thinking, research, and public speaking skills. Computer Education is designed to equip the students with the knowledge and skills to be competent individuals of the digital age. It provides a venue for the students to gain competency in the use of different computer programs and applications. 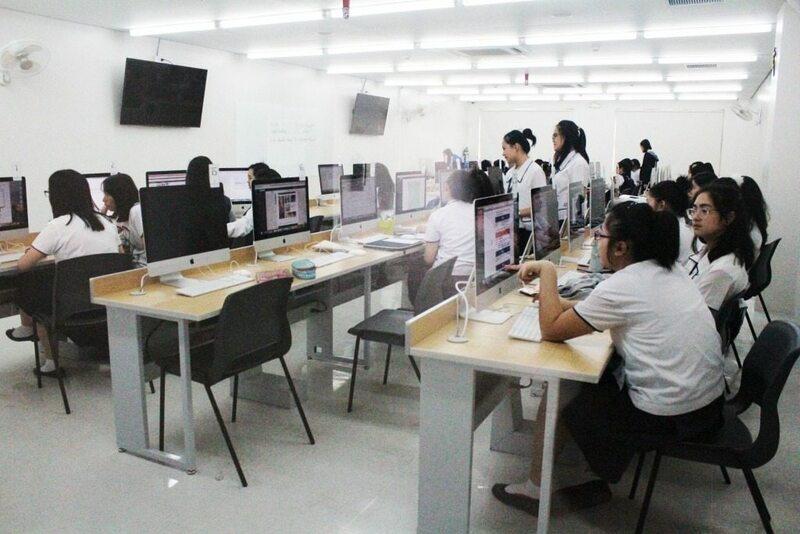 Computer Ethics guides the students in their laboratory outputs and use of the internet. Computer lessons include effective digital communication through the creation, manipulation and design of graphics and images with the use of Adobe Photoshop CS4. The lessons will also cover animation using Adobe Flash CS4 and web design using Adobe Dreamweaver CS4. Using the programming language Action Script 3.0, which is integrated in Adobe Flash CS4, the students will learn how to create interactive applications, e-learning content and e-tools. Using Visual Basic.NET, students will create and develop varied programs. Home Arts provides for learning opportunities in Basic Clothing Construction. The course covers areas like different machine stitches, effective and creative use of the sewing machine and production of simple home accessories. The students develop technical skills that may be applied in other endeavors. The highlight of the course is the creation or modification of wearable and innovative garments and other novelty items. Ultimately, the students will develop appropriate preferences in clothing as young ladies. Home Living as a course will help the students acquire desirable habits, skills and attitudes related to nutrition, good food, health and wellness. The students will learn the proper and safe ways to move around and work in the kitchen. The highlight of the course is the preparation of varied soups, salads and sandwiches for healthier living for oneself and the family. Applied Fashion Design and Technology provides students with basic concepts and skills in Fashion Designing. The course introduces the students to creative and technical skills and the key principles in drafting patterns and constructing clothes. The major output of the students center on innovative garments which will be featured in a “Project Runway Challenge.” In this culminating activity, the students are guided in the promotion of the values of simplicity, modesty and propriety. Culinary Arts provides hands-on learning opportunities on the basics of cooking and baking. Culinary experiences may vary from simple recipes to age-old tested classic meals and desserts. Entrepreneurship is introduced as students will learn how to cost, package, and sell their baked products or meals for a good profit. The course includes lessons on business ethics. Research as a subject combines academic rigor with real world relevance. Investigative researches support the school’s environmental advocacies. Thus, students produce studies to provide alternative solutions to problems such as air, water and land pollution. Application of scientific principles learned in the different science disciplines finds its way in the various investigative projects of the students. It encourages the students to ask questions, frame hypotheses and design their own experiments to draw conclusions. Students defend their work before a panel of judges who are experts in their respective fields of study. Basic Accounting as a course provides students with the essential knowledge of accounting principles. This helps them understand the language of business and prepares them to be future business leaders and entrepreneurs with integrity and conscience. Discussions on business accounting concepts and processes, supplemented with illustrative problems, develop students’ skills in critical thinking and making sound financial decisions. The course emphasizes values like honesty, accuracy, precision, responsibility, and organization, all of which are essential to succeed in any given field. Music and Arts provides opportunities for students to be exposed to Philippine, Asian, and Western music. The students learn the fundamental elements of music and apply these through performances such as individual and group singing, playing Filipino and Asian instruments, and creating music and movements in theatre, dance and stage presentations. Physical Education and Health promotes lifetime health and wellness through the integration of health and physical fitness concepts. It aims to instill among the students the value of being healthy not only in the physical but also on the social, mental and emotional dimensions. The program provides opportunities for students to engage in various physical activities such as sports, recreational games, fitness exercises and dance. In particular, it aims to cultivate healthy habits, teamwork, resilience and resolve. Moreover, safety awareness and basic first aid measures supplement students’ development of life skills. Included in the program is Citizen Advancement Training. The students are given opportunities to practice their leadership skills such as serving and assisting in school and community events. They are also given activities to practice fitness exercises and physical trainings which will develop skills for emergency situations. The Chinese Language Arts program helps the students appreciate the unique and distinctive culture of China and makes the students learn and understand the different interactions China has with its neighboring countries. It acquaints the students with practical terms that can be used in their day-to-day activities and in their future business transactions. Conversation drills are provided to make them proficient in the language. Recitations of tongue twisters and poetry, learning of Chinese songs and folk dances, role-playing, and calligraphy writing are being taught. Homeroom classes are designed to help students achieve greater self-awareness, self-understanding and self-acceptance with emphasis on interpersonal relationships and conflict resolution. These classes aim at the formation of values, attitudes, study habits, social graces and leadership skills. Human sexuality and drug education are also emphasized. Career planning and decision making activities are given during homeroom classes to prepare the students for university life. Activities such as journal writing, group sharing, class discussion, enrichment talks, role-playing, film showing and pen and paper exercises enhance the classroom experience. These sessions are facilitated by both year level counselors and the class advisers. Co-Curricular Activities are geared towards the total development of the ICAn as a person- aware and appreciative of her potentials and willing to assume the responsibility for developing these gifts to the fullest in the service of others. Co-curricular activities constitute an integrated whole with the curriculum. Thus, the activities organized by each club should flow from the instructional programs and as such, become a practicum for the subject areas concerned. Club moderators inform and consult their respective supervisors regarding possible activities to be undertaken. They consult the Student Activities Coordinator regarding logistics concerns. Extra-curricular activities are mainly avenues to develop student leadership since extra-curricular organizations are highly student-driven. Moderators guide the students in refining their ideas for activities, ensuring that the activities stay true to the organization’s thrust. All extra-curricular organizations fall under the supervision of the SAC. Student activities are meant to supplement, not to substitute for the instructional program. Hence regular class sessions may not be used for practices for such activities, except in certain cases approved by the Principal. A club on its first year of operation is given the status of a new club. It goes through a probationary period of 2 years within which it has to prove itself as having worthwhile objectives and activities. However, any new club which proves itself to be outstanding in both its objectives and activities, even on its first year, will be recommended for the status of a recognized club of the school after the first year. A standing club is one which has been recognized by the school as a club with well-planned and worthwhile objectives and activities. Such recognition comes after a careful and thorough evaluation by the Student Activities Coordinator and AFSWB, who then refers this matter to the Principal and Directress. All students are required to join one co-curricular club and they may opt to join an unlimited number of extra-curricular organizations, provided that they manage to attend the regular meetings. Membership in clubs and organizations is part of the criteria for academic honors and awards for the graduating class. The school reserves the right to exclude or suspend any student from participating in activities if she needs to devote more time to her studies or as a disciplinary sanction for an offense committed as a member of the club. Membership in co-curricular clubs is on a yearly basis. Students can only change membership after a school year. Membership in extra-curricular organizations is also on a yearly basis. However, a member may quit or be removed from the organization within the year. Each organization sets its own criteria for recruitment and removal of a member. A membership fee or monthly due, if necessary, is agreed upon by the club members and officers and approved by the club moderator, SAC and AFSWB. Membership fees may not exceed Two Hundred Pesos (PhP 200.00) for a school year, unless otherwise justified by the club/organization and approved by the moderator, SAC, and AFSWB. Only students who have a quarterly grade not lower than C in all subjects in the past four quarters, conduct mark not lower than B+ in the past four quarters are eligible for the positions of club/organization officers. However, clubs and organizations may set higher standards than those set forth in this manual. A class officer may be an officer either in one co-curricular club OR in one extra-curricular organization/committee. A class officer who is a club officer may not have the same positions in both her class and club/organization. No student is allowed to hold positions in both special co-curricular clubs and extra-curricular organizations/sports teams/committees (Fair, Variety Show, Interaction, Batch committees, etc.). Student Council (SC) Officers cannot be club/organization or class officers. CAT officers may be club officers but not class officers. Given her limited responsibilities, only the COMELEC chairperson may be allowed to hold another position in an extra-curricular organization/Sports Team/committee. Class hours and academic requirements are not eased out in favor of student activities. The activity will be held outside class hours. Approval is obtained from the Club Moderator, the SAC, AFSWB, and the Directress. Any club, group, or individual member must not use the name and or seal of the school without authorization. This applies to printed programs, invitations, announcements, tickets and other promotional materials. Press releases concerning the club/organization should be noted by the SAC and AFSWB. If said information is released off-campus, the Directress’ approval is required. Whenever students are required to be in school beyond class hours or on non-class days, parents are given a written notice duly signed by the moderator and school administrators. For the safety of the students, they may not be allowed to enter the campus without the official request of authorities concerned and without a supervising teacher. It is the personal responsibility of every student to adopt a balanced program of academic and co-curricular/extra-curricular activities. All student clubs, organizations, and activities in the name of the school are subject to the supervision and control of the Administration. A club which needs to go for exposure trips, field trips, or social action activities outside the school must be accompanied by its moderator. A club with more than fifteen (15) members must be accompanied by its moderator and other teacher-chaperones. In every vehicle used for the trip, there must be an adult chaperone. Students who are not permitted by their parents to join their club’s off-campus activity on a club day will be required to join another club. The moderator will designate the club her members will join for the day. She will endorse her members to the moderator of that club.